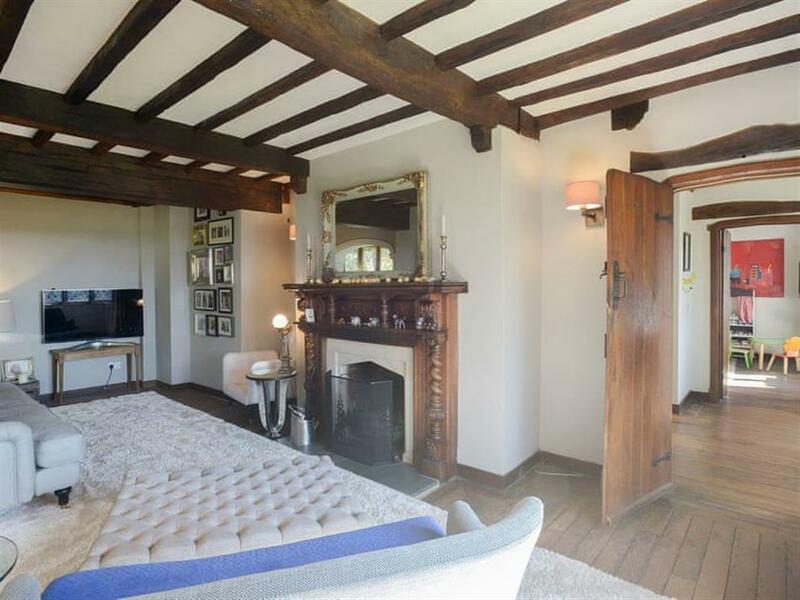 Greystones in Crawley, near Winchester, Hampshire sleeps 8 people. Greystones near Winchester is a peacefully located detached family home which dates back over 100 years and was built by its first owner at the turn of the 20th century. 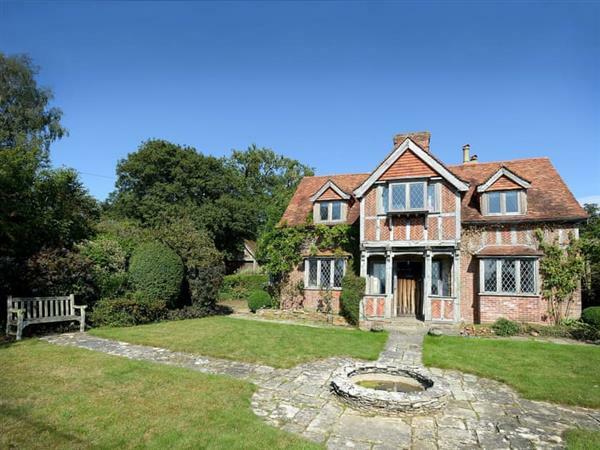 Built in the Jacobean/Tudor style, this unique property gets its name as it was built using local ’grey stones’ and timber beams sourced from the boatyards of nearby Portsmouth. This comfortable character home is nestled in the glorious Hampshire countryside and enjoys super views from the front of the house. It has much English charm and originality, with its diamond pane window, oak beams, wooden floors and ½-acre lawned gardens, combined with neutral colour schemes and modern furnishings. As well as the main living room with ornate fireplace, there is a small playroom filled with toys, a formal dining room and a large kitchen with breakfast area and Aga – the hub of the home! Discover one of the many excellent walks in the area including Farley Mount, Cheesefoot Head to St Catherines Hill and Up Somborne to Pionsent, as well as some of the best fishing in the UK for trout in and around the clear waters of the River Test. There is a renowned, traditional pub/restaurant within easy walking distance, and also a duck pond and a historic church in this pretty idyllic hamlet. The nearby city of Winchester is steeped in history and culture. It was originally a Roman town dating back to 70AD and the Great Hall of the castle was built in the 12th century, where King Arthur’s Round Table stands. King Egbert, the first King of England, was crowned in Winchester in 827 and the city remained the capital until the 11th century. Winchester is sometimes referred to as the legendary Camelot, and the film ’The Da Vinci Code’ was partly filmed in the area. Winchester Cathedral draws visitors from all over the world, and other sightseeing attractions include Wolvesey Palace, the Old Bishop’s Palace, and Winchester College, which is one of the oldest public schools in England. Some of the graves of our greatest monarchs, bishops and famous literary authors such as Jane Austen are in this parish. The Test Way is nearby which is a very popular walking and cycling route, or visit the 18th-century mansion of Broadlands, the former home of Lord Palmerston and also the late Lord Louis Mountbatten, with its extensive gardens. Broadlands is open to the public July and August, and hosts a range of craft shows, concerts and events throughout the year. Nearby Stockbridge has a riding school, tea rooms, pubs, restaurants, art galleries, craft and gift shops, a delicatessen and traditional butcher, as well as The Houghton Club, the oldest fishing club in England. The gin distillery is also well worth a visit! Other places to visit include Mottisfont Abbey (National Trust), Paultons Park with Peppa Pig World, Marwell Zoo, Mid Hants Watercress Railway Line, Houghton Lodge Gardens, Hinton Ampner and the ever popular New Forest National Park, with its roaming ponies, extensive heathland and picturesque villages. Within an hours’ drive are Stonehenge, Weyhill Hawk Conservancy, The Museum of Arm Flying, Thruxton Races, Wilton House, Highclere Castle, Beaulieu Abbey and the National Motor Museum, and Bucklers Hard. Mudeford, Christchurch and Bournemouth’s beaches are an hour or so by car (depending on traffic). There are a few golf courses in the area, the nearest is about 5 miles distant. The shop is 2 miles from Greystones near Winchester, with the pub and restaurant being ½ mile from Greystones. Living room: With open fire and Sky TV (basic package). Dining room: With Sky TV (basic package), a selection of games and toys, and double sofa bed (for flexible sleeping arrangements). Kitchen: With breakfast area, Aga, microwave, fridge/freezer and dishwasher. Bedroom 2: With king-size bed and Sky TV (basic package. Gas central heating, electricity, bed linen, towels, Wi-Fi and logs for open fire included. Travel cot and highchair available on request. Welcome pack. ½-acre enclosed lawned garden with sitting-out area, garden furniture and barbecue. Private parking for 4 cars. No smoking. Please note: There is a small pond in the front garden, 20 yards away. Holidays at Greystones run from Monday to Monday. For a better idea of where Greystones is, you can see Greystones on the map below. Greystones is in Hampshire; should you be on the lookout for a special offer, you can find all the special offers in Hampshire. It's always worth checking to see what is on offer at the moment. Do you want to holiday near Greystones (UKC3934), you can see other cottages within 25 miles of Greystones; have a look to find your perfect holiday location.